Diabetes is not for dummies. 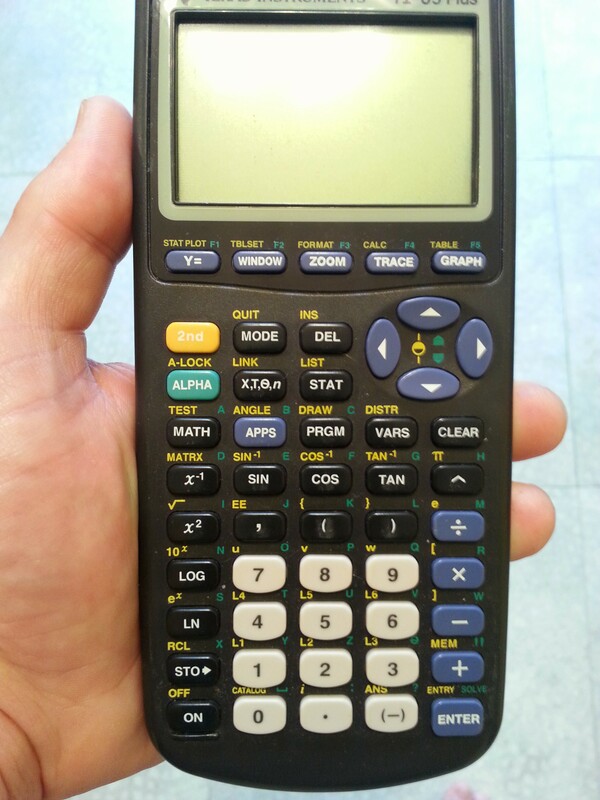 People who keep tight control of theirÂ diabetesÂ must be eitherÂ mathemeticiansÂ or own (and know how to operate) a Texas Instruments calculator like the one pictured on the right. Let’sÂ do the math:Â Thatâ€™s one unit for every ten carbohydrates, plus one more unit for every 40 mg/dl over my target mg/dl, minus an expected value of glucose fluctuation based on “strenuous” exercise, minus the derivation of the stress coefficient when the variance is greater than the sum of the ml/dg, times the square root of pie . . . sugar-free, of course. In intense exercise (>80%Â VO2max), unlike at lesser intensities, glucose is the exclusive muscle fuel. It must be mobilized from muscle and liver glycogen in both the fed and fasted states. Therefore, regulation of glucose production (GP) and glucose utilization (GU) have to be different from exercise at <60%Â VO2max, in which it is established that the portal glucagon-to-insulin ratio causes the less than or equal to twofold increase in GP. GU is subject to complex regulation by insulin, plasma glucose, alternate substrates, other humoral factors, and muscle factors. At lower intensities, plasma glucose is constant during postabsorptive exercise and declines during postprandial exercise (and often in persons with diabetes). During such exercise, insulin secretion is inhibited by Î²-cell Î±-adrenergic receptor activation. Let me simplify theÂ paragraph above and make it more practical for you: If you have type-1 diabetes and you exercise really hardÂ . . . umm . . . never mind. I believe I got to >80%Â VO2max just trying to figure it out. I thinkÂ it has something to do with something my liver does at intense exercise that’s different than when the exercise isn’t as intense, but I’m not sure what that means because now my blood sugar is really low and my brain stopped functioning properly. Here’s what I do know: Caring for diabetes, like other things in life, is a holistic pursuit. It’s not just physical; it includes the mental, emotional, social, and spiritual dimensions as well. Oh, and let’s not forget my favorite, the “humoral factors.” After all, laughter is the best medicine.